The problem starts after the user has had their Windows profile recreated but continues to experience some Outlook performance issues. Each time she clicks the New button in Outlook to create a new message, there is a 5 to 10 second delay before the blank message opens. There is also a 10+ second delay after she clicks send and Outlook becomes unresponsive for that time. I connect to her and quickly look at the Office Outlook registry for any unapproved 3rd party add-ins and see nothing out of the ordinary. I decide to dump the Outlook process when the hang is encounter and turn to Process Explorer. This is a simple matter of right-clicking the process and choosing Create Dump when it is in an unresponsive state. Actually, I collect two dumps, the other with Procdump in hang mode. I do this to ensure that the dumps are consistent; if the dumps are not similar then I may need to collect more until a pattern emerges. 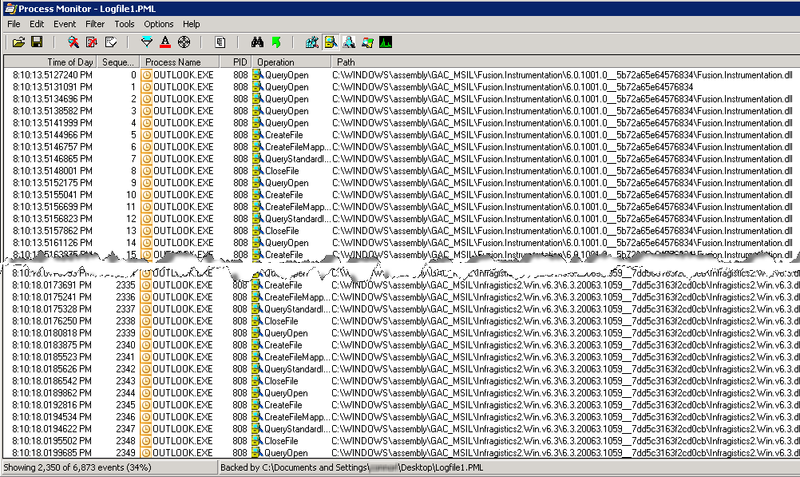 I copied the dumps to my workstation and opened them with WinDbg and run the !analyze –v –hang command. The stack for both dumps are similar. 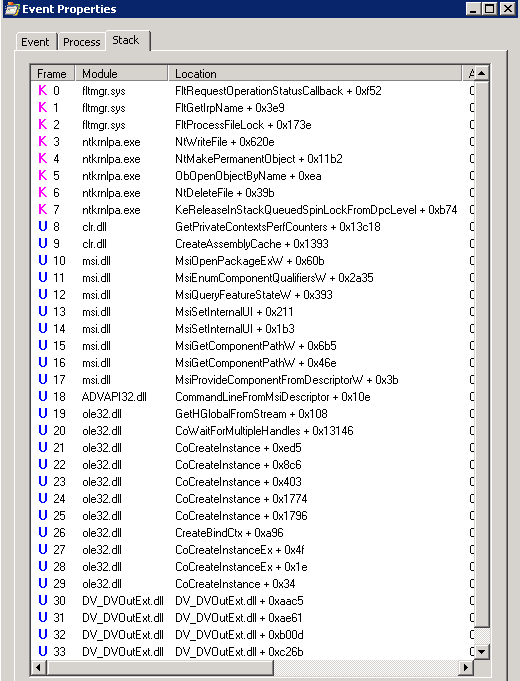 With the exception of the NRTExchn component (our DMS add-in for Outlook), these are all MS modules. Normally, this wouldn’t excite me but something stands out like a sore thumb as I move up the stack, the presence of msi.dll in the stack of the current examine thread. Although it shouldn’t matter which version of the DLL is being used to populate this key, as an experiment I decide to edit the registry of the workstation with the Outlook delay with the information of the WorkShare product. Interestingly, upon opening a new message, there was no longer a delay. There was, however, still a noticeable hang when sending an email; there were probably some additional guids or reg keys that are involved, but at this point it was no longer necessary to track them down. Instead, I should be able to resolve the issue by uninstalling ITSM. Upon doing so, it deleted the guid above. However, since this guid exists with the WorkShare product, running a scripted fix of WorkShare recreated the key. Afterwards, I was able to open a new message promptly and send it with no further delays. The real moment of truth, however, was to reinstall ITSM and then ensure the hangs did, in fact, not come back, and I was happy to see they didn’t. This entry was posted on May 1, 2012 at 6:25 am	and is filed under Office, Troubleshooting, Troubleshooting Tools. Tagged: Hang, Outlook, Process Explorer, Process Monitor, WinDbg. You can follow any responses to this entry through the RSS 2.0 feed. You can leave a response, or trackback from your own site.